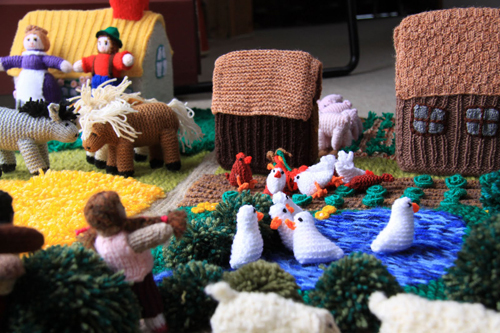 Knit a farmyard for charity! Here at Knit for Peace, our big idea is to find talented knitters and knitting groups to make us beautiful knitted farmyards. Once we have enough, we’ll organise an exhibition in London that will end in an auction of the farmyards to raise funds for our knitting groups in India. We are also raising money to help us distribute knitted items to charities in the UK and around the world. To encourage knitters to get their needles going for us, we’re offering a free two-week stay in the Green Hotel as a prize for the best farmyard. Unfortunately we cannot provide patterns for these projects, however these are available in Hannelore Wernhard’s Knitted Farmyard and Jan Messent’s Knitted Gardens. We will be holding an exhibition and sale of Knitted Farmyards and Knitted Gardens, with all proceeds going towards the work of Knit for Peace. We can’t wait to see your entries! For the best knitted garden or farmyard we are offering two week’s free accommodation at the Green Hotel in Mysore, South India. 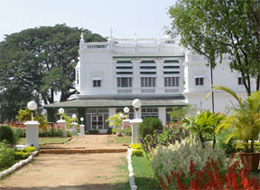 Once a palace for Mysore’s princesses, it has been lovingly restored as a small hotel, and offers comfortable surroundings, friendly staff, and a restful, creative atmosphere. Please note that travel costs are not included in the prize.